Washing one's hands, a form of hygiene, is the number one way to prevent the spread of infectious disease. Transmission of infectious diseases may also involve a " vector". Vectors may be mechanical or biological. A mechanical vector picks up an infectious agent on the outside of its body and transmits it in a passive manner. An example of a mechanical vector is a housefly, which lands on cow dung, contaminating its appendages with bacteria from the feces, and then lands on food prior to consumption. The pathogen never enters the body of the fly. 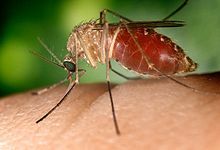 Culex mosquitos ( Culex quinquefasciatus shown) are biological vectors that transmit West Nile Virus. Figure 1: A simplified model of how disease transmission in small-world networks can be prevented. Major focus should be on preventing jumps between hubs (green cross out) in addition to prevention within infected hubs (red cross outs). One of the ways to prevent or slow down the transmission of infectious diseases is to recognize the different characteristics of various diseases. Some critical disease characteristics that should be evaluated include virulence, distance traveled by victims, and level of contagiousness. The human strains of Ebola virus, for example, incapacitate its victims extremely quickly and kills them soon after. As a result, the victims of this disease do not have the opportunity to travel very far from the initial infection zone. Also, this virus must spread through skin lesions or permeable membranes such as the eye. Thus, the initial stage of Ebola is not very contagious since its victims experience only internal hemorrhaging. As a result of the above features, the spread of Ebola is very rapid and usually stays within a relatively confined geographical area. In contrast, Human Immunodeficiency Virus ( HIV) kills its victims very slowly by attacking their immune system. As a result, a lot of its victims transmit the virus to many others before even realizing that they are carrying the disease. Also, the relatively low virulence allows its victims to travel long distances, increasing the likelihood of an epidemic. Microbiological culture is a principal tool used to diagnose infectious disease. In a microbial culture, a growth medium is provided for a specific agent. A sample taken from potentially diseased tissue or fluid is then tested for the presence of an infectious agent able to grow within that medium. Most pathogenic bacteria are easily grown on nutrient agar, a form of solid medium that supplies carbohydrates and proteins necessary for growth of a bacterium, along with copious amounts of water. A single bacterium will grow into a visible mound on the surface of the plate called a colony, which may be separated from other colonies or melded together into a "lawn". The size, color, shape and form of a colony is characteristic of the bacterial species, its specific genetic makeup (its strain), and the environment which supports its growth. Other ingredients are often added to the plate to aid in identification. 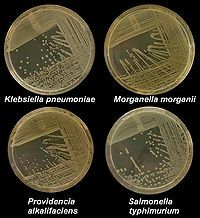 Plates may contain substances that permit the growth of some bacteria and not others, or that change color in response to certain bacteria and not others. Bacteriological plates such as these are commonly used in the clinical identification of infectious bacteria. Microbial culture may also be used in the identification of viruses: the medium in this case being cells grown in culture that the virus can infect, and then alter or kill. In the case of viral identification, a region of dead cells results from viral growth, and is called a "plaque". Eukaryotic parasites may also be grown in culture as a means of identifying a particular agent. In the absence of suitable plate culture techniques, some microbes require culture within live animals. Bacteria such as Mycobacterium leprae and T. pallidum can be grown in animals, although serological and microscopic techniques make the use of live animals unnecessary. Viruses are also usually identified using alternatives to growth in culture or animals. Some viruses may be grown in embryonated eggs. Another useful identification method is Xenodiagnosis, or the use of a vector to support the growth of an infectious agent. Chaga's disease is the most significant example, because it is difficult to directly demonstrate the presence of the causative agent, Trypanosoma cruzi in a patient, which therefore makes it difficult to definitively make a diagnosis. In this case, xenodiagnosis involves the use of the vector of the Chaga's agent T. cruzi, an uninfected triatomine bug (subfamily Triatominae), which takes a blood meal from a person suspected of having been infected. The bug is later inspected for growth of T. cruzi within its gut. Serological methods are highly sensitive, specific and often extremely rapid tests used to identify microorganisms. These tests are based upon the ability of an antibody to bind specifically to an antigen. The antigen, usually a protein or carbohydrate made by an infectious agent, is bound by the antibody. This binding then sets off a chain of events that can be visibly obvious in various ways, dependent upon the test. For example, " Strep throat" is often diagnosed within minutes, and is based on the appearance of antigens made by the causative agent, S. pyogenes, that is retrieved from a patients throat with a cotton swab. Serological tests, if available, are usually the preferred route of identification, however the tests are costly to develop and the reagents used in the test often require refrigeration. Some serological methods are extremely costly, although when commonly used, such as with the "strep test", they can be inexpensive. Thus, the technological ability to detect any infectious agent rapidly and specifically are currently available. The only remaining blockades to the use of PCR as a standard tool of diagnosis are in its cost and application, neither of which is insurmountable. The diagnosis of a few diseases will not benefit from the development of PCR methods, such as some of the clostridial diseases ( tetanus and botulism). These diseases are fundamentally biological poisonings by relatively small numbers of infectious bacteria that produce extremely potent neurotoxins. A significant proliferation of the infectious agent does not occur, this limits the ability of PCR to detect the presence of any bacteria. Resistance to infection ( immunity) may be acquired following a disease, by asymptomatic carriage of the pathogen, by harboring an organism with a similar structure (crossreacting), or by vaccination. Knowledge of the protective antigens and specific acquired host immune factors is more complete for primary pathogens than for opportunistic pathogens. Note: Other causes of death include maternal and perinatal conditions (5.2%), nutritional deficiencies (0.9%), non-communicable conditions (58.8%), and injuries (9.1%). The top three single agent/disease killers are HIV/ AIDS, TB and malaria. While the number of deaths due to nearly every disease have decreased, deaths due to HIV/AIDS have increased fourfold. Childhood diseases include pertussis, poliomyelitis, diphtheria, measles and tetanus. Children also make up a large percentage of lower respiratory and diarrheal deaths. 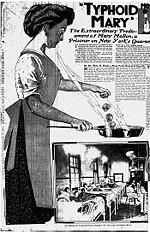 The Influenza Pandemic of 1918 (or the Spanish Flu) killed 25-50 million people (about 2% of world population of 1.7 billion). Today Influenza kills about 250,000 to 500,000 worldwide each year. Modern transport. Ships and other cargo carriers often harbor unintended "passengers" that can spread diseases to faraway destinations. While with international jet-airplane travel, people infected with a disease can carry it to distant lands, or home to their families, before their first symptoms appear. Pollution of the environment. Changes in the climate (such as global warming) can cause microorganisms to adapt and create new strains, which can give them an evolution advantage.